The sandy beaches, seaside towns, and natural wonders of Taiwan’s North Coast lie just a short drive from Taipei. 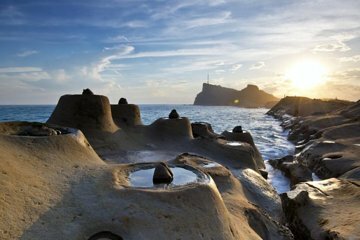 On this tour, take in all the highlights in just one day, including the unique landscapes of the Yehliu Geopark, the famous Keelung Miaokou Night Market, and Fugueijiao Lighthouse. Plus, have chance to try local specialties such as fresh seafood and pineapple cake. Hotel name need to be provide for pick-up and drop-off. Departs daily except for Monday. Book at least 2 days in advance. Yes! I loved this tour! I know those off the beaten path trips. I think this tour needs to be marketed so more people can know about it. My tour guide Frank was awesome. He was a cool guy and took well care of me the entire time. I had a great time in this trip! I will definitely recommend it to everyone who needs a relaxing trip to get away from the busy Taipei City.